McGraw-Hill Workforce's Career Companion series provides up to date career information and contextualized skill practice to help learners explore and prepare for careers. 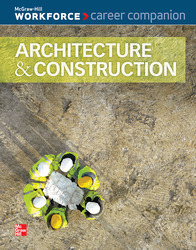 Architecture & Construction introduces readers to this career cluster by exploring career pathways and jobs within architecture and construction, education and training requirements, work environments, and current industry trends. Preparation for career readiness and success in architecture and construction careers is provided through applied workplace skills practice using real-world scenarios set in the architecture and construction industry. This special value pack contains 10 copies.